Product prices and availability are accurate as of 2019-04-17 21:27:37 EDT and are subject to change. Any price and availability information displayed on http://www.amazon.com/ at the time of purchase will apply to the purchase of this product. Pro Wickis based on pure rosin and meets all of the most stringent soldering standards for worldwide applications: MIL-F-142560D Type R NASA specification NHB5300.4 NPC200-4 and SP-5002. The advanced braid design has a strong capillary action that works instantly to pull in excess solder. Each roll is individually vacuum-packed to protect it from moisture and prolong shelf life. 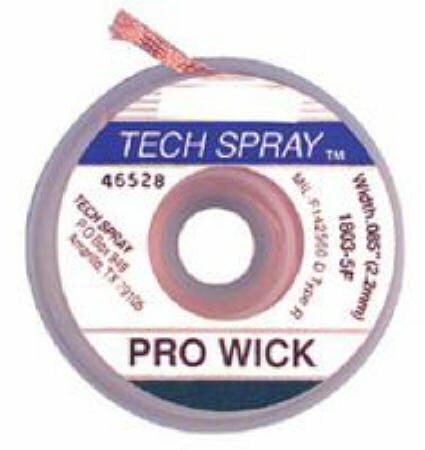 Pro-Wick Desoldering Braid -.098" x 5" Blue.